Petite correction Romain, l’affiche « The Thing » a été illustré uniquement par le célèbre Drew Struzan. Quand je parle de visuels, je ne pas parle pas nécessairement de l’affiche finale! Sur son site, vous trouverez aussi de beaux dessins préparatoires. Romain, this version seems to be the one used for the soundtrack LP. 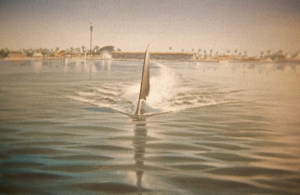 The drawring is inverted but it is the same fin, water and background that had the skiers and shark head added for the early version of the poster used in the album. You right, the background is the same in the LP artwork version. The fin is smaller but it’s definitly the same fin. Just wanted you to know Alec Gillis is posting wonderful behind the scenes of building miniatures of Jaws 3-D.
Je voulais juste que vous sachiez Alec Gillis est l’affichage merveilleux dans les coulisses de la construction des miniatures de Jaws 3 – D .
Thank you Brian. I’m a follower of Alec Gillis on Twitter. The pictures are so great! 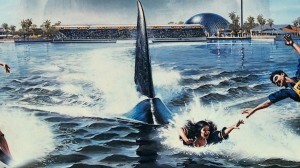 Never before seen stuff!I will post that on jaws-3d.com !